Following our back to back fine dining feasts, The Astronomer and I were primed for something super-casual but equally delicious on Sunday before driving back to L.A. FIVE50 Pizza Bar, conveniently located on the first floor of our hotel, fit the bill just right. 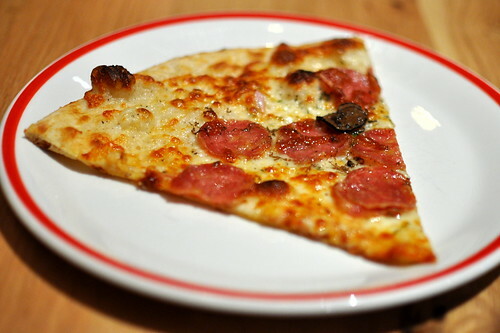 I’ve been a fan of Chef Shawn McClain‘s cooking since dining at Sage several years ago, and was excited to try his spin on classic East Coast-style pizza. 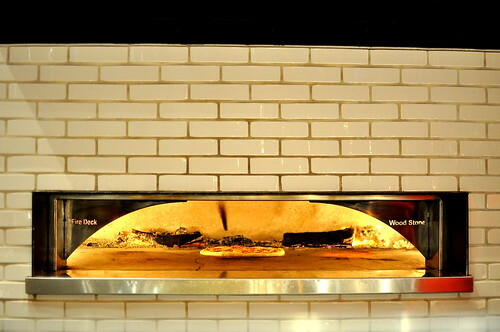 The restaurant is named after “the ideal temperature to cook your pizza to perfection,” according to the restaurant’s website. 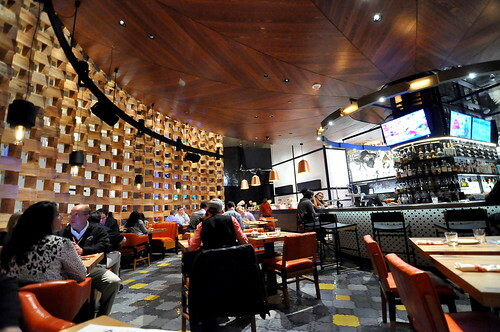 Even though the cooking at Five50 is serious, the mood is perfectly laid back. The Astronomer appreciated the bountiful flat screens, while I liked the room’s colorful accents. To start, an order of the warm root vegetables ($13) that included roasted beets, carrots, and pee wee potatoes, spinach, and whipped goat cheese. 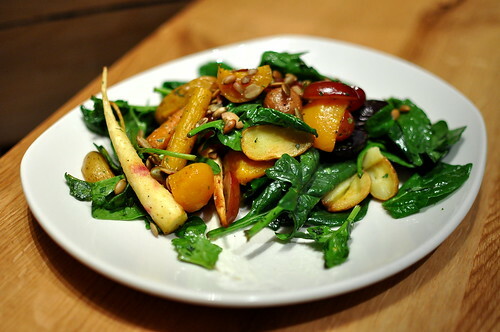 After two decadent days of foams and foie gras, this unfussy plate of good-for-you vegetables was very much welcomed. Even though FIVE50 is best known for its pies, I couldn’t resist ordering a bowl of hand-made pasta too. 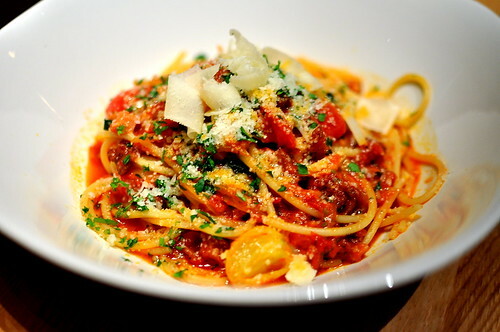 The bucatini all’amatriciana ($16) with guanciale, Calabrian chili, cherry tomatoes, and Parmesan was seriously stellar, quite possibly even better than the pizzas. I am a noodle lover through and through. With vegetables and pasta already down our gullets, The Astronomer and I only had enough room for one pizza. I had the toughest time choosing between the eight varieties on offer, but thankfully our waitress informed us that half of one kind and half of another was acceptable. Whew! 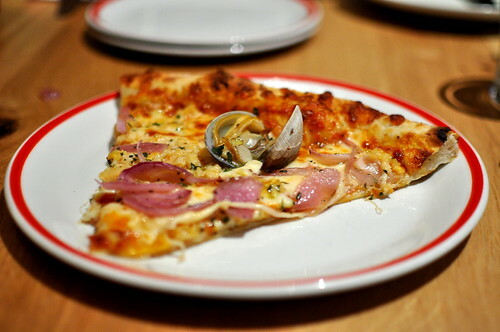 One side of our 16-inch pie was dedicated to the “North Beach” ($28), scattered with clams, smoked mozzarella, sweet onions, and oregano. The Astronomer and I both agreed that this one could’ve used additional clams—three lowly clams for half a pizza just ain’t gonna cut it. For the second half of our pizza we chose the “Truffle” ($29), which included truffle salami, bechamel sauce, Parmesan, fresh thyme, and shaved truffles. 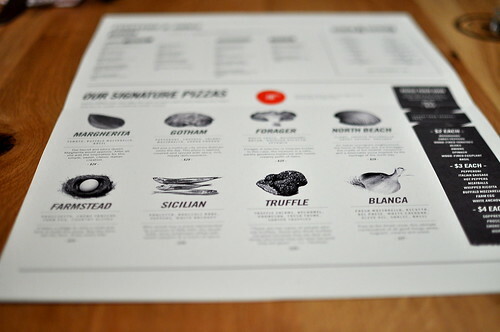 The truffle salami was on point—savory, earthy, delicious. Rivaling the bucatini all’amatriciana for the title of the “Best Thing We Ate at Five50” were the sourdough fritters we shared for dessert. 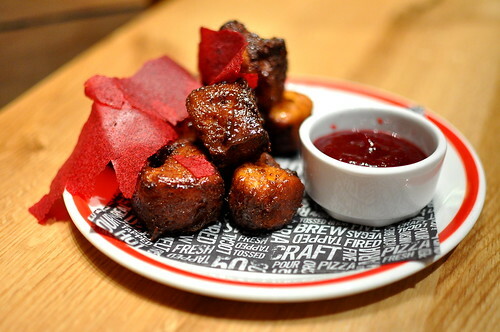 A duo of cranberry items, leather and sauce, was served alongside. 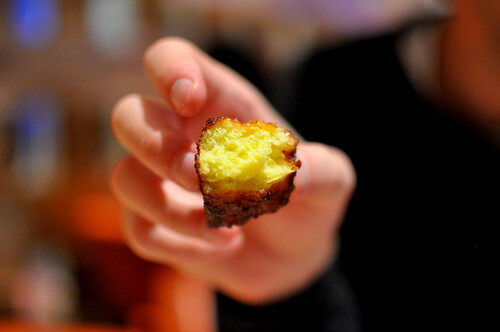 The fritters, brushed with an orange glaze, were crisp and caramelized on the outside and impressively light within. The zingy accouterments proved to be the perfect foils. Mmm! 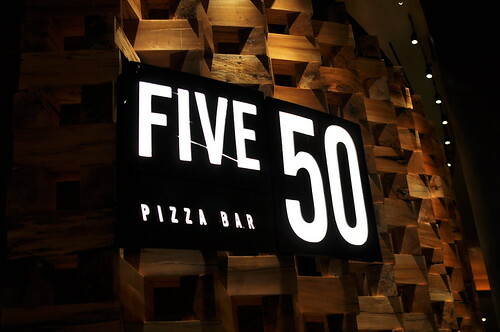 FIVE50 Pizza Bar: Good times.